Have you been dreaming of a romantic getaway? Just imagine you and your loved one getting back to nature nestled away in a secluded, cozy tent site and surrounded by nature’s glorious melodies; the crickets chirping, rustling of tree leaves and flowing water from the nearby creek. Add a crackling fire, an oversized sleeping bag and a tent for two…need we say more? Come snuggle under the stars and fall in love all over again at Lover’s Lane, a cozy corner of our park that’s dedicated to tent camping and reserved exclusively for couples. No kids, no groups, no kidding. We provide the ambiance, you make the memories. A picnic table, fire ring, water and electric are provided for your comfort. 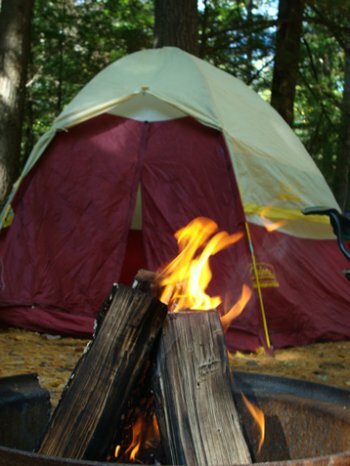 Bring your own tent camping gear or jump in the car with clothes and toothbrush and buy the rest at the camp store! Reserve your peace and quiet today - and remember, grown-ups only!